What is it? 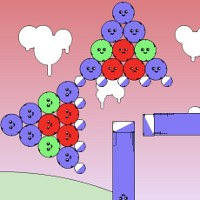 – Red Remover is a great physics-based puzzle game where you’ll have to remove all of the red shapes from each level, while leaving the green ones on-screen. Who made it? – The game was developed by Gaz of TheGameHomepage. How does it play? – The game plays sort of like a reverse-engineered version of the Super Stacker series of games, with a dash of the Totem Destroyer series thrown in for good measure. Each level presents you with a configuration of shapes, and you need to remove pieces so that only the green shapes remain. Red shapes must be removed or pushed off-screen. Blue shapes are neutral and don’t need to be removed, though they can be manipulated or eliminated to help solve the puzzle. There are 40 main levels in all, and five bonus levels. You can use as many clicks to complete a level as you’d like, but each level also has a “par” score. Making or besting par for all of the main levels will unlock the bonus levels. A few unlockables are available (including different face-styles for the shapes), and a level editor is also included. Presentation – The game is visually simplistic, with a bright color palette and cheerful atmosphere. Many of the shapes have smiley faces which aren’t purely for cosmetic cuteness. Some levels have multiple different gravitational rules, and you can tell how gravity will affect a specific shape based on the direction of its face. Positives – The gameplay is simple to grasp, and while completing all 40 levels shouldn’t be incredibly challenging for most gamers, you’re bound to be stumped briefly for a couple of stages. That said, completing all of the levels with a “par” score is bit tougher, requiring you to pre-plan each of your moves. Negatives – Some may find that the difficulty is a bit lacking, especially when compared to similar games that involve physics and shape manipulation. It’s not a completely pedestrian experience, but I was able to complete the majority of the levels on my first attempt, often meeting the “par” score requirement. Why you should play it – Red Remover is a well-constructed puzzle game with some clever (though relatively easy) puzzles. Completionists may find a bit more depth and challenge trying to collect all of the unlockables, and the level editor is a nice bonus. At the very least, it’s a good way to escape the daily grind for a while without breaking your brain.